This series started yesterday when I started wondering about the exact reason we needed economic growth to keep the unemployment rate down. I wrote an introductory post then, explaining I was going to do some learning in public. (The risk of embarrassing myself is real). Now I want to dive into this a bit more. It’s true we need economic growth to prevent the unemployment rate rising. I checked and important people believe it. Recessions send unemployment spiking. And so can low growth. Phew! That’s one thing I got right. The link between economic growth and changes in unemployment is real and it has been formalised in a relationship called Okun’s Law. I put the word out on Twitter for an explanation and I was swamped with awesome economists offering helpful explanations. Thanks to everybody. @RHTGreen@jasemurphy Arithmetically, you’ll need enough to keep up with growth in the labour force and technological progress. Because of population growth you need growth in output to have jobs for the new people. Because of labour productivity changes (people getting more efficient) you need more output or else you’ll employ fewer people. This is a nice neat story. If you have 2 per cent labour force growth and 1 per cent productivity gains, you need 3 per cent growth. It’s mathematically sound. I learned something. So is that it? Are we wrapped up? All silent? I still find myself with questions. I want to understand things in more than just mathematical terms. Productivity causes growth. It allows us to produce more, using the same. But we also need growth to compensate for it? This sends me into something of a chicken and egg loop. I’m aware that chicken/egg scenario is why economics uses maths so much. Supply and demand need to be solved simultaneously. You can’t think through a market equilibrium slowly because you need an answer on both sides at once. So I could stop here. But I have other questions. If rising labour productivity is both cause and cure for unemployment, why is it spoken of in exclusively glowing terms? Would we not be as well off, in unemployment terms, without it? If we did not have the population growth, would we still have stable unemployment? This remains my sticking point – my reason for wondering about the deeper reasons and implications of why we need 3 per cent growth. Seems to me an important part of the existing population is employed creating space for the new population to live in. While the productivity angle makes sense to me, the population one still gives me pause. Establishing the new capital stock to accommodate the lives of new babies and new migrants is a huge cause of economic activity. More roads, more shops for them to shop in, more buildings for them to live in, more pipes going to their houses, more hospitals for them to be sick in, etc. New population consumes and works the same as the existing population; but also requires extra spending. I intuitively believe population growth causes a rise in employment so I can’t quite grasp that it’s a wash, unemployment wise. Whenever I think about this question I think about Japan, where capital is being abandoned as the population shrinks, and (while unemployment is low) secure employment is a problem. Perhaps I need to think about this differently? Perhaps I need some more empirical evidence? I’ll dive deeper and present what I find tomorrow. If you have any thoughts on this topic or want to suggest some reading, please feel free to make a comment below. I would suggest you look into technological unemployment. I know you have briefly discussed this before but you don’t seem to understand it is the remedy to the itch you have. Without consumption and population growth we would need to stop learning as a species. The response to the argument is “The surplus frees people to pursue other avenues”…unemployed. The answer you seek, maybe you need more? To refer back to my original comment. “Borrowed money”. The surplus is not “free”, or to those that are newly unemployed it is not available. The surplus is created only from established transactions after which it can then be dispersed via investment. What is the entrepreneurial success rate again? Remember nobody is going to employ you without growth. Your questions are yet another reason why technological unemployment is more encompassing than most assume, given they even grant the thought. Just found your blog via a friend. Firstly, great blog. Secondly, good on you for asking questions. No one can know everything, but many people are too scared to seek out new knowledge. Who cares if people find out you don’t know everything about a topic! 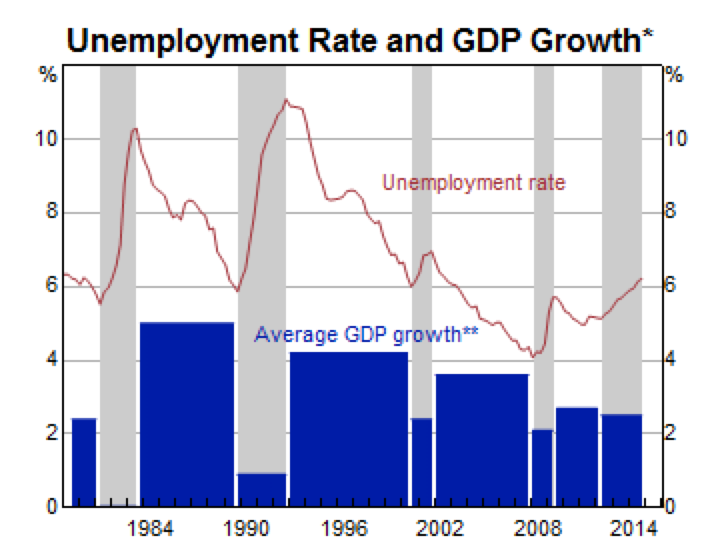 Thirdly, for what it’s worth, I think the 3% growth = steady unemployment rate theory has to do with output gaps. If our potential output is 3% a year, and we only hit 2% that year, we have underutilisation of resources. This means underutilised capital, and it means underutilised workers i.e. 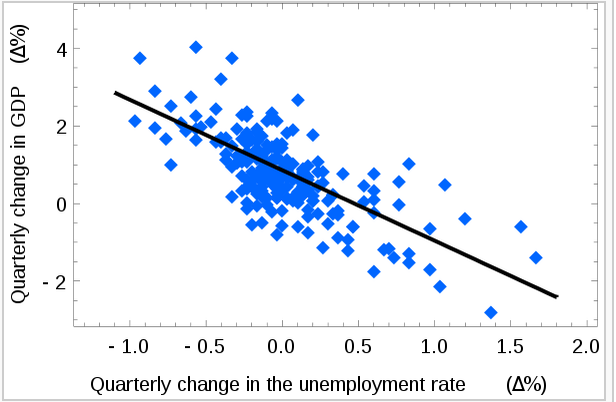 unemployment above the NAIRU. • Because of population growth you need growth in output to have jobs for the new people. • Because of labour productivity changes (people getting more efficient) you need more output or else you’ll employ fewer people. The way I’ve come to these insights is by using Treasury’s IGR’s long-run GDP growth decomposition. They decompose long-run real GDP growth into population growth, participation and (labour) productivity growth elements. If real GDP growth is constant, rising population growth could be offset by falling participation (or productivity growth). If GDP growth is constant, rising productivity growth could be offset by contracting population growth, or by lower participation (or less hours per worker worked, if that makes sense). One last complication is that real GDP only measures market activity. I see future trends leading to a rise in non-market activity relative to market activity. If this happens, this will reduce potential and actual real GDP growth in the future despite welfare increasing. For example, freely-provided services such as Facebook and Google Maps are welfare enhancing but it’s hard to capture their GDP impacts. You can really only capture GDP impacts via their advertising revenues. Their value to consumers are far more than this. You can also see it in IT trends. The faster and better computers of today provide much more welfare than the original Apple Macs or Intel 486’s of the early 90’s. But they also cost a lot less, in relative terms. Less GDP impact, despite being more welfare-enhancing. So, I think real GDP as a measure, going into the future, will have less and less utility. Economists today talk of Gross National Income being a better measure than GDP for welfare. GNI includes wealth transfers from abroad, but its base is still GDP. So I don’t think it’s a long-term solution. We’ll need something better than a 3% real GDP target to maintain steady unemployment.